It has been suggested that this article be merged into Hydropower. (Discuss) Proposed since November 2018. 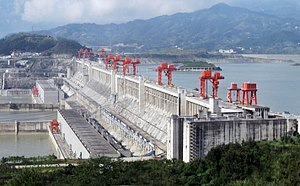 The Three Gorges Dam in Central China is the world's largest power–producing facility of any kind. The technical potential for hydropower development around the world is much greater than the actual production: the percent of potential hydropower capacity that has not been developed is 71% in Europe, 75% in North America, 79% in South America, 95% in Africa, 95% in the Middle East, and 82% in Asia-Pacific. The political realities of new reservoirs in western countries, economic limitations in the third world and the lack of a transmission system in undeveloped areas result in the possibility of developing 25% of the remaining technically exploitable potential before 2050, with the bulk of that being in the Asia-Pacific area. Some countries have highly developed their hydropower potential and have very little room for growth: Switzerland produces 88% of its potential and Mexico 80%. Small hydro is the development of hydroelectric power on a scale serving a small community or industrial plant. The definition of a small hydro project varies but a generating capacity of up to 10 megawatts (MW) is generally accepted as the upper limit of what can be termed small hydro. This may be stretched to 25 MW and 30 MW in Canada and the United States. Small-scale hydroelectricity production grew by 29% from 2005 to 2008, raising the total world small-hydro capacity to 85 GW. Over 70% of this was in China (65 GW), followed by Japan (3.5 GW), the United States (3 GW), and India (2 GW). ("eta") is the coefficient of efficiency (a unitless, scalar coefficient, ranging from 0 for completely inefficient to 1 for completely efficient). Efficiency is often higher (that is, closer to 1) with larger and more modern turbines. Annual electric energy production depends on the available water supply. In some installations, the water flow rate can vary by a factor of 10:1 over the course of a year. Hydropower is a flexible source of electricity since stations can be ramped up and down very quickly to adapt to changing energy demands. Hydro turbines have a start-up time of the order of a few minutes. It takes around 60 to 90 seconds to bring a unit from cold start-up to full load; this is much shorter than for gas turbines or steam plants. Power generation can also be decreased quickly when there is a surplus power generation. Hence the limited capacity of hydropower units is not generally used to produce base power except for vacating the flood pool or meeting downstream needs. Instead, it can serve as backup for non-hydro generators. Where a dam serves multiple purposes, a hydroelectric station may be added with relatively low construction cost, providing a useful revenue stream to offset the costs of dam operation. It has been calculated that the sale of electricity from the Three Gorges Dam will cover the construction costs after 5 to 8 years of full generation. However, some data shows that in most countries large hydropower dams will be too costly and take too long to build to deliver a positive risk adjusted return, unless appropriate risk management measures are put in place. Since hydroelectric dams do not use fuel, power generation does not produce carbon dioxide. While carbon dioxide is initially produced during construction of the project, and some methane is given off annually by reservoirs, hydro generally has the lowest lifecycle greenhouse gas emissions for power generation. Compared to fossil fuels generating an equivalent amount of electricity, hydro displaced three billion tonnes of CO2 emissions in 2011. According to a comparative study by the Paul Scherrer Institute and the University of Stuttgart, hydroelectricity in Europe produces the least amount of greenhouse gases and externality of any energy source. Coming in second place was wind, third was nuclear energy, and fourth was solar photovoltaic. The low greenhouse gas impact of hydroelectricity is found especially in temperate climates. Greater greenhouse gas emission impacts are found in the tropical regions because the reservoirs of power stations in tropical regions produce a larger amount of methane than those in temperate areas. Like other non-fossil fuel sources, hydropower also has no emissions of sulfur dioxide, nitrogen oxides, or other particulates. Merowe Dam in Sudan. Hydroelectric power stations that use dams submerge large areas of land due to the requirement of a reservoir. These changes to land color or albedo, alongside certain projects that concurrently submerge rainforests, can in these specific cases result in the global warming impact, or equivalent life-cycle greenhouse gases of hydroelectricity projects, to potentially exceed that of coal power stations. A 2011 study by the National Renewable Energy Laboratory concluded that hydroelectric plants in the U.S. consumed between 1,425 and 18,000 gallons of water per megawatt-hour (gal/MWh) of electricity generated, through evaporation losses in the reservoir. The median loss was 4,491 gal/MWh, which is higher than the loss for generation technologies that use cooling towers, including concentrating solar power (865 gal/MWh for CSP trough, 786 gal/MWh for CSP tower), coal (687 gal/MWh), nuclear (672 gal/MWh), and natural gas (198 gal/MWh). Where there are multiple uses of reservoirs such as water supply, recreation, and flood control, all reservoir evaporation is attributed to power production. Lower positive impacts are found in the tropical regions, as it has been noted that the reservoirs of power plants in tropical regions produce substantial amounts of methane. This is due to plant material in flooded areas decaying in an anaerobic environment and forming methane, a greenhouse gas. According to the World Commission on Dams report, where the reservoir is large compared to the generating capacity (less than 100 watts per square metre of surface area) and no clearing of the forests in the area was undertaken prior to impoundment of the reservoir, greenhouse gas emissions from the reservoir may be higher than those of a conventional oil-fired thermal generation plant. Smaller dams and micro hydro facilities create less risk, but can form continuing hazards even after being decommissioned. For example, the small earthen embankment Kelly Barnes Dam failed in 1977, twenty years after its power station was decommissioned, causing 39 deaths. The ranking of hydro-electric capacity is either by actual annual energy production or by installed capacity power rating. In 2015 hydropower generated 16.6% of the worlds total electricity and 70% of all renewable electricity. Hydropower is produced in 150 countries, with the Asia-Pacific region generated 32 percent of global hydropower in 2010. China is the largest hydroelectricity producer, with 721 terawatt-hours of production in 2010, representing around 17 percent of domestic electricity use. Brazil, Canada, New Zealand, Norway, Paraguay, Austria, Switzerland, Venezuela, and several other countries have a majority of the internal electric energy production from hydroelectric power. Paraguay produces 100% of its electricity from hydroelectric dams and exports 90% of its production to Brazil and to Argentina. Norway produces 96% of its electricity from hydroelectric sources. ^ a b c d e Worldwatch Institute (January 2012). 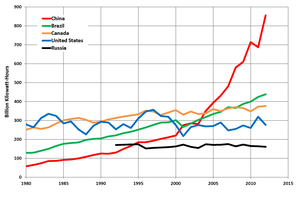 "Use and Capacity of Global Hydropower Increases". ^ a b "History of Hydropower". U.S. Department of Energy. ^ a b c "Hydroelectric Power". Water Encyclopedia. ^ "Boulder Canyon Project Act" (PDF). December 21, 1928. Archived from the original (PDF) on June 13, 2011. ^ The Book of Knowledge. Vol. 9 (1945 ed.). p. 3220. ^ "hydro electricity - explained". ^ "Run-of-the-River Hydropower Goes With the Flow". ^ "Energy Resources: Tidal power". ^ "Micro Hydro in the fight against poverty". Tve.org. Archived from the original on 2012-04-26. Retrieved 2012-07-22. ^ "Pico Hydro Power". T4cd.org. Archived from the original on 2009-07-31. Retrieved 2010-07-16. ^ Robert A. Huggins (1 September 2010). Energy Storage. Springer. p. 60. ISBN 978-1-4419-1023-3. ^ Herbert Susskind; Chad J. Raseman (1970). Combined Hydroelectric Pumped Storage and Nuclear Power Generation. Brookhaven National Laboratory. p. 15. ^ a b Bent Sørensen (2004). Renewable Energy: Its Physics, Engineering, Use, Environmental Impacts, Economy, and Planning Aspects. Academic Press. pp. 556–. ISBN 978-0-12-656153-1. ^ Geological Survey (U.S.) (1980). Geological Survey Professional Paper. U.S. Government Printing Office. p. 10. ^ "Beyond Three Gorges in China". Waterpowermagazine.com. 2007-01-10. Archived from the original on 2011-06-14. ^ a b "External costs of electricity systems (graph format)". ExternE-Pol. Technology Assessment / GaBE (Paul Scherrer Institut). 2005. Archived from the original on 1 November 2013. ^ Wehrli, Bernhard (1 September 2011). "Climate science: Renewable but not carbon-free". Nature Geoscience. 4 (9): 585–586. doi:10.1038/ngeo1226 – via www.nature.com. ^ Atkins, William (2003). "Hydroelectric Power". Water: Science and Issues. 2: 187–191. ^ a b Robbins, Paul (2007). "Hydropower". Encyclopedia of Environment and Society. 3. ^ "Sedimentation Problems with Dams". Internationalrivers.org. Retrieved 2010-07-16. ^ John Macknick and others, A Review of Operational Water Consumption and Withdrawal Factors for Electricity Generating Technologies, National Renewable Energy Laboratory, Technical Report NREL/TP-6A20-50900. ^ Patrick James, H Chansen (1998). "Teaching Case Studies in Reservoir Siltation and Catchment Erosion" (PDF). Great Britain: TEMPUS Publications. pp. 265–275. Archived from the original (PDF) on 2009-09-02. ^ Șentürk, Fuat (1994). Hydraulics of dams and reservoirs (reference. ed.). Highlands Ranch, Colo.: Water Resources Publications. p. 375. ISBN 0-918334-80-2. ^ "WCD Findal Report". Dams.org. 2000-11-16. Archived from the original on 2013-08-21. 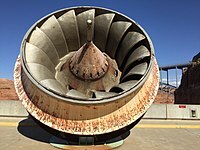 ^ "Hydroelectric power's dirty secret revealed". Newscientist.com. ^ ""Rediscovered" Wood & The Triton Sawfish". Inhabitat. 2006-11-16. ^ "Briefing of World Commission on Dams". Internationalrivers.org. 2008-02-29. ^ a b References may be found in the list of Dam failures. ^ Lawson, Michael L. (1982). Dammed Indians: the Pick-Sloan Plan and the Missouri River Sioux, 1944–1980. Norman: University of Oklahoma Press. ^ a b "Binge and purge". The Economist. 2009-01-22. Retrieved 2009-01-30. 98-99% of Norway’s electricity comes from hydroelectric plants. ^ "2015 Key World Energy Statistics" (PDF). report. International Energy Agency (IEA). Retrieved 1 June 2016. ^ "Indicators 2009, National Electric Power Industry". Chinese Government. Retrieved 18 July 2010. ^ "Belo Monte hydroelectric dam construction work begins". Guardian UK. 10 March 2011. Retrieved 2 April 2011. ^ "Belo Monte dam construction halted by Brazilian court". Guardian UK. 16 August 2012. Retrieved 24 August 2012. ^ "Upper Siang project likely to be relocated on Chinese concerns". Thehindubusinessline.com. 2006-03-24. Archived from the original on 2010-08-18. Retrieved 2012-07-22. ^ "Brazil Sends Forces to Jirau Dam After Riots". Wall Street Journal. 18 March 2011. Retrieved 2 April 2011. ^ "二滩水电开发有限责任公司". Ehdc.com.cn. 2009-04-25. Archived from the original on 2012-10-18. Retrieved 2012-07-22. ^ "陆良县人口和计划生育局". Zt.xxgk.yn.gov.cn. Archived from the original on 2012-07-17. Retrieved 2012-07-22. ^ Staff (2004). "Caroní River Watershed Management Plan" (PDF). Inter-America Development Bank. Archived from the original (PDF) on October 28, 2008. Retrieved 2008-10-25.